Picture this: Snow White, an Englishwoman, flies to Hong Kong for her father's funeral. When she arrives, she realizes her "evil stepmother" is out to kill her. She then heads to mainland China and meets seven "reknown warriors" and together, they take down the evil stepmother. Sounds good, right? 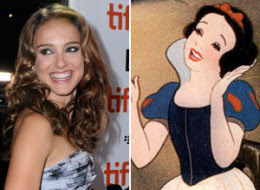 The live-action film is said to star Natalie Portman with Toy Story 3 screenwriter Michael Arndt at the helms. The name of the film: Snow White and the Seven, costarring Jet Li as one of the seven. Both Portman and Arndt are nominated for Academy Awards this year. Portman, for her portrayal of a perfectionist ballerina descending into madness in Black Swan, and Arndt for his work with Toy Story 3. Disney has yet to set a release date for the Snow White remake.